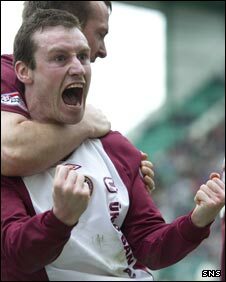 Stephen Elliott's late equaliser saved a point for 10-man Hearts after an exciting derby against Hibernian. Both sides threatened in a thrilling start before Ryan Stevenson's low drive gave Hearts a 24th-minute lead. Marius Zaliukas was sent off for a push on Akpo Sodje and Liam Miller scored the resulting 35th-minute penalty. Recent signing Ricardo Vaz Te prodded Hibs into a winning position with 10 minutes left, but Elliott volleyed in the equaliser three minutes later. And it could rule out a fourth Edinburgh derby this season, with Hibs now seven points adrift of Motherwell in the battle to finish in the top six of the Scottish Premier League before it splits for the final five games. Stevenson had been handed a start along with Andrew Driver, Ismael Bouzid and Jamie MacDonald as third-top Hearts were without goalkeeper Marian Kello and Rudi Skacel through injury and Andrian Mrowiec through suspension, while David Obua was dropped to the bench. Milller and Jimmy Scott started in Hibs' first outing in almost a month and the latter set up Derek Riordan with an early chance. The former Ross County midfielder's chip over Hearts defence fell kindly for the Scotland forward, only for Riordan to rush his shot and side-foot his effort well wide. Hearts responded immediately with a low ball from Driver into the path of Elliott, but the striker fired straight at Mark Brown and the goalkeeper beat it away before it was thumped cleared. Hibs left-back Callum Booth sent a powerful low drive at goal from edge of the box, but it was straight at goalkeeper MacDonald. When Scott thrust his studs into the heel of midfield counterpart Ian Black, the game could have boiled over, but fortunately the excitement continued to be generated by the attacking play of both sides. A Stevenson corner found the unmarked Elliott four yards out after being dummied by Ruben Palazuelos at the front post, but it reached the striker at chest height and he could only deflect it into the goalkeeper's arms. Bouzid was next to squander a good chance for Hearts moments later from a curling Craig Thomson free-kick, the defender flicking his header wide of the far post. Driver had been looking dangerous in only his second start of a season blighted by injury and provided the cross that set up the opening goal. After it fell to Stevenson after being half-cleared by a Hibs head, the midfielder controlled it with his right before half-volleying home with his left from 16 yards. Hearts were looking comfortable in their lead until Hibs equalised out of the blue thanks to a reckless Zaluikas challenge. Zaliukas blatantly pushed Sodje as the Lithuanian realised that he was not going to reach a cross into the box and referee Iain Brines sent off the defender after awarding a penalty kick that Miller fired home clinically into the corner. Hearts manager Jim Jefferies hauled off winger David Templeton as he bolstered his defence with Jason Thomson, but his side were now trapped in their own half. Goalkeeper Brown raced off his line to kick clear when Riordan was played through on goal then Francis Dickoh should have done better than head down and over from 10 yards after rising to meet a fine curling Booth cross. Hibs boss Colin Calderwood looked to continue the pressure on the Hearts defence by introducing former Bolton striker Ricardo Vaz Te in place of midfielder Scott at half-time. Yet Hearts were the side who were the ones peppering the opposition penalty box in the early stages of the second half until Black's mis-control presented Hibs with a golden opportunity. Miller's pass found Victor Palsson in space on the edge of the box, but the former Liverpool midfielder fired over the crossbar after the ball took an awkward bobble and struck his shin. That ecouraged the home side and Riordan went close when he fired in a drive that MacDonald parried before the Hibs forward powered an effort on the rebound from a difficult angle just over the crossbar. The Leith outfit looked to have snatched victory when Vaz Te flicked David Wotherspoon's cross into his own path before driving home from 14 yards. However, Andy Webster headed a Craig Thomson free-kick into the six-yard box and Elliott provided the finish. Two fine saves from MacDonald prevented Riordan and Matt Thornhill from restoring Hibs' lead as they forced Hearts into some desperate defending in the dying moments. 90:00+3:40 The match has reached full-time. 90:00+3:26 Ruben Palazuelos takes a shot. Save by Mark Brown. 90:00+2:49 Inswinging corner taken right-footed by Jason Thomson played to the near post. 90:00+0:50 Derek Riordan produces a left-footed shot from deep inside the penalty area which goes wide of the right-hand post. 90:00+0:20 Free kick awarded for a foul by Ryan McGowan on Ricardo Vaz Te. Direct free kick taken by Mark Brown. 89:08 Outswinging corner taken right-footed by David Wotherspoon. 89:00 Akpo Sodje sends in a cross, blocked by Craig Thomson. 88:33 Derek Riordan takes a shot. Save by Jamie MacDonald. 87:16 Short corner taken by Matt Thornhill. 85:43 Rudi Skacel challenges Francis Dickoh unfairly and gives away a free kick. Direct effort from the free kick comes in from Derek Riordan, save made by Jamie MacDonald. 84:03 Booking Stephen Elliott is booked. 82:54 Free kick awarded for an unfair challenge on Jason Thomson by Matt Thornhill. Assist by Andy Webster. 82:54 GOAL - Stephen Elliott:Hibernian 2 - 2 Hearts Stephen Elliott finds the back of the net with a goal from close range to the bottom left corner of the goal. Hibernian 2-2 Hearts. 81:40 Substitution Rudi Skacel on for Ian Black. 81:12 Substitution Liam Miller leaves the field to be replaced by Ian Murray. 79:31 David Wotherspoon provided the assist for the goal. 79:31 GOAL - Ricardo Vaz Te:Hibernian 2 - 1 Hearts Ricardo Vaz Te grabs a goal from inside the six-yard box to the bottom right corner of the goal. Hibernian 2-1 Hearts. 78:36 Richie Towell sends in a cross, clearance by Jason Thomson. 77:56 Derek Riordan is caught offside. Jamie MacDonald restarts play with the free kick. 76:45 Ryan Stevenson takes a shot. Save by Mark Brown. 75:23 Derek Riordan sends in a cross, clearance made by Craig Thomson. 71:11 Substitution Ryan McGowan on for Andrew Driver. 71:01 Effort from inside the area by Derek Riordan misses to the right of the target. 70:49 Derek Riordan takes a shot. Save by Jamie MacDonald. 70:20 David Wotherspoon crosses the ball, Akpo Sodje takes a shot. Andy Webster gets a block in. 68:52 Substitution (Hibernian) makes a substitution, with David Wotherspoon coming on for Victor Palsson. 68:28 Richie Towell crosses the ball, Shot by Ricardo Vaz Te from 12 yards. Andy Webster gets a block in. 67:56 The ball is swung over by Richie Towell, Jason Thomson manages to make a clearance. 67:44 The ball is sent over by Derek Riordan, clearance made by Andy Webster. 65:55 Ryan Stevenson fouled by Victor Palsson, the ref awards a free kick. The ball is crossed by Stephen Elliott, Headed effort from inside the area by Andy Webster misses to the left of the target. 64:53 Free kick awarded for an unfair challenge on Ian Black by Matt Thornhill. Jason Thomson takes the direct free kick. 60:38 Ricardo Vaz Te delivers the ball, save by Jamie MacDonald. 59:24 Corner taken by Callum Booth from the left by-line. 57:08 Ricardo Vaz Te takes a shot. Blocked by Andy Webster. 56:20 The ball is crossed by Richie Towell. 53:18 Victor Palsson produces a right-footed shot from inside the area that clears the bar. 52:31 Corner taken right-footed by Craig Thomson from the left by-line, Paul Hanlon manages to make a clearance. 51:54 Inswinging corner taken by Craig Thomson from the left by-line played to the near post, Francis Dickoh manages to make a clearance. 50:58 The ball is crossed by Richie Towell. 49:10 Free kick awarded for an unfair challenge on Jason Thomson by Paul Hanlon. Free kick taken by Jason Thomson. 48:17 Ian Black gives away a free kick for an unfair challenge on Victor Palsson. Derek Riordan crosses the ball from the free kick right-footed from left channel, Andy Webster makes a clearance. 46:13 Stephen Elliott fouled by Francis Dickoh, the ref awards a free kick. Ian Black takes the direct free kick. 45:01 Substitution Ricardo Vaz Te comes on in place of Martin Scott. 45:00+1:04 The ref blows to signal half-time. 45:00+0:12 Francis Dickoh has a headed effort at goal from close in which goes wide left of the target. 44:21 The referee gives a free kick against Ruben Palazuelos for handball. The free kick is swung in right-footed by Derek Riordan, clearance made by Andy Webster. 44:21 Booking Ruben Palazuelos receives a yellow card. 42:38 The ball is swung over by Derek Riordan, Andy Webster manages to make a clearance. 37:57 Free kick awarded for a foul by Matt Thornhill on Ruben Palazuelos. Ismael Bouzid restarts play with the free kick. 36:06 Ryan Stevenson is adjudged to have handled the ball. Mark Brown restarts play with the free kick. 35:10 Substitution David Templeton goes off and Jason Thomson comes on. 34:38 Booking Booking for Liam Miller for unsporting behaviour. Correction - 34:26 Marius Zaliukas gives away a Penalty for an unfair challenge on Akpo Sodje. The assist for the goal came from Akpo Sodje. 34:26 Marius Zaliukas challenges Akpo Sodje unfairly and gives away a Penalty. 34:26 GOAL - Liam Miller:Hibernian 1 - 1 Hearts Liam Miller scores a penalty. Hibernian 1-1 Hearts. 32:51 Sent off Marius Zaliukas receives a red card for professional foul. 31:53 Martin Scott produces a left-footed shot from just outside the penalty box that misses to the left of the goal. 31:10 Ryan Stevenson is caught offside. Mark Brown restarts play with the free kick. 29:10 Stephen Elliott is penalised for a handball. Free kick taken by Mark Brown. 24:54 Liam Miller takes a shot. Jamie MacDonald makes a save. 24:13 Akpo Sodje produces a right-footed shot from outside the penalty area and misses left. 23:02 The assist for the goal came from Andrew Driver. 23:02 GOAL - Ryan Stevenson:Hibernian 0 - 1 Hearts Goal scored by Ryan Stevenson from just inside the penalty area to the bottom right corner of the goal. Hibernian 0-1 Hearts. 21:24 Corner taken by Craig Thomson, save made by Mark Brown. 20:45 Marius Zaliukas concedes a free kick for a foul on Akpo Sodje. Direct free kick taken by Derek Riordan. 18:56 Shot from a long way out by Liam Miller goes wide of the left-hand post. 17:53 Matt Thornhill concedes a free kick for a foul on Craig Thomson. Jamie MacDonald takes the free kick. 16:52 Craig Thomson crosses the ball, clearance made by Paul Hanlon. 14:50 Unfair challenge on David Templeton by Callum Booth results in a free kick. Craig Thomson sends in a cross, Header from close in by Ismael Bouzid misses to the left of the goal. 13:00 Header by Akpo Sodje from deep inside the penalty area misses to the right of the target. 12:08 Craig Thomson takes a inswinging corner to the near post, save by Mark Brown. 9:44 Craig Thomson fouled by Akpo Sodje, the ref awards a free kick. Direct free kick taken by Craig Thomson. 8:58 Free kick awarded for a foul by Ismael Bouzid on Matt Thornhill. Victor Palsson takes the free kick. 7:02 Ian Black fouled by Martin Scott, the ref awards a free kick. Direct free kick taken by Andy Webster. 7:02 Booking Martin Scott booked for unsporting behaviour. 6:13 Richie Towell produces a cross. 5:15 Matt Thornhill takes a shot. Save by Jamie MacDonald. 4:25 Unfair challenge on Craig Thomson by Richie Towell results in a free kick. Free kick crossed by Craig Thomson, clearance by Paul Hanlon. 3:44 Stephen Elliott takes a shot. Mark Brown makes a save. 2:24 Corner taken by Craig Thomson, clearance made by Akpo Sodje. 1:43 Derek Riordan produces a volleyed right-footed shot from deep inside the penalty area which goes wide of the right-hand post. 1:08 Centre by David Templeton. 0:22 Matt Thornhill challenges Ryan Stevenson unfairly and gives away a free kick. Free kick crossed right-footed by Craig Thomson from right channel, Matt Thornhill makes a clearance.